The 2013 Italian Grand Prix marked the fifth race in a row that a Red Bull encountered mechanical issues. Following Vettel’s retirement in Silverstone, Webber’s horror pitstop in Germany and both drivers’ mechanical issues in Hungary, Webber’s clutch issues at the start of the Belgian Grand Prix, both Red Bulls suffered gearbox issues at Monza. As this is the last year of the explosive pairing of Sebastian Vettel and Mark Webber, I looked through the history books to see how mechanical issues, team orders, and clashes with each other have affected both Red Bull drivers. China: Vettel can only make one run in each qualifying session due to driveshaft problems. Turkey: Vettel is given the team order not to challenge Webber for 2nd place. Belgium: Webber had an unsafe release during his pit stop, leading to a drive-through penalty. Hungary: Vettel retires with suspension faillure. Europe: Vettel has to make a 2nd stop because of fuel rig problems, and then retires with an engine problem. Singapore: Webber retires with a brake problem. Japan: Webber has issues with his headrest, forcing him to make 2 extra pit stops. Bahrain: Vettel loses the lead due to a spark plug failure, dropping him back to 4th. Bahrain: Webber had a slow pit stop, which lost him a position to Button. Australia: Vettel retires from the lead due to a brake failure. Spain: Vettel has brake issues late in the race, which drop him back from second to third place. Monaco: After Monaco, it is found that Vettel’s chassis was cracked. Turkey: Vettel loses out on pole position due to a broken anti-rollbar. Turkey: Webber loses the lead after Vettel colides with him. Canada: Webber had to change his gearbox, leading to a 5-place grid penalty. Canada: Vettel has gearbox issues during the race. Britain: After a front wing failure left the team with one new spec front wing, Webber was given the old spec. Germany: Webber had an oil pick-up problem late in the race. Italy: Vettel’s engine shortly died half-way through the race. Korea: Vettel retires from the lead due to an engine failure. Brazil: Webber struggles with high engine temperatures in the race. Australia: Webber had KERS issues in Q2 and Q3. Australia: Vettel and Webber had KERS issues during the race. Australia: Webber had problems with his chassis. Malaysia: Webber had no KERS in Q3. Malaysia: Vettel and Webber had KERS issues during the race. Malaysia: Vettel has brake problems late in the race. China: Webber qualifies 18th after electrical problems in practice. China: Vettel has KERS issues during the race. Spain: Vettel had KERS issues during qualifying. Spain: Vettel had KERS issues throughout the race. Monaco: Webber had radio issues shortly before his pit stop, causing a slow stop. Canada: Webber had KERS issues during qualifying. Europe: Webber had gearbox issues later in the race, dropping him from 2nd to 3rd. Britain: A faulty wheelgun at his pit stop drops Vettel from the lead into 2nd place. Britain: Vettel has KERS issues late in the race. Britain: Webber was given team-orders not to challenge Vettel, who had KERS issues. 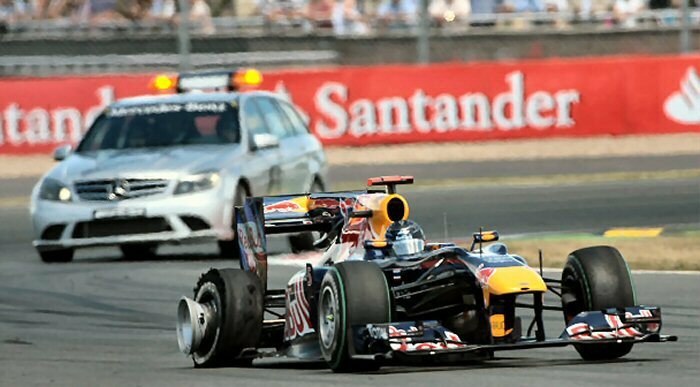 Britain: Vettel was challenged by Webber, who ignored the team orders not to. Germany: Vettel has brake issues during the race. Hungary: Webber had no KERS in Q2, which returned in Q3. Hungary: Webber’s DRS failed during Q3. Hungary: Vettel has brake issues during the race. Belgium: Webber misses the pit call and had to go for another lap. Italy: Webber had KERS issues in qualifying. Singapore: Webber had no DRS during the race, which he believed dropped him from 2nd to 3rd. Abu Dhabi: Vettel has a tire puncture in turn 1. Brazil: Vettel has gearbox issues, which drops him from the lead, to finish 2nd. Australia: Both Vettel and Webber had KERS issues in qualifying. Malaysia: Vettel’s radio stopped working shortly after the restart. Bahrain: Webber had no KERS for the first lap. Spain: Webber is held too long in Q2, making him miss out on Q3. Spain: Both Vettel and Webber had to have their front wing changed during the race. Canada: Webber has engine issues early on in the race. Europe: Webber had DRS issues in qualifying, which left him at the back of the starting grid. Europe: Vettel retires from the lead due to an alternator failure. Germany: Webber had to change his gearbox, leading to a 5-place grid penalty. Germany: Vettel has KERS issues during the race. Hungary: Webber had an issue with his differential. Belgium: Webber receives a 5-spot grid penalty for a gearbox change. Italy: Vettel retires with an alternator failure. India: Webber’s KERS issue dropped him from 2nd to 3rd. Abu Dhabi: Vettel’s fuel pump issues in qualifying sent him to the back of the starting grid. United States: Webber retires with an alternator failure. Brazil: Vettel’s start is affected after Webber ignored instructions not to challenge him. Brazil: Webber is issued a team order to let Vettel pass. Brazil: Vettel’s radio stops working, leading to wrong tires at the pit stop. Brazil: Vettel’s last change of tires saw a 7.6 second slower pit stop. Australia: Webber has ECU/KERS issues for the first part of the race. Australia: Webber returns in traffic after the front jack failed in the pit stop. Malaysia: Vettel is given a team order not to challenge Webber half-way through the race. Malaysia: Vettel is given a team order not to overtake Webber after the final pit stops. Malaysia: Webber loses the lead after Vettel ignores a team order. China: Webber lost fuel pressure in Q2. China: Webber’s wheel comes off during the race. Britain: Vettel retires from the lead with gearbox issues. Germany: Webber’s first pit stop goes disastrous, which puts him back at the end of the field. Hungary: Webber has KERS issues during qualifying. Hungary: Vettel has overheating and KERS issues during the race. Belgium: Webber has clutch issues at the start of the race. Italy: Both Vettel and Webber have gearbox issues, which causes them to have to short-shift. vaya, se cae la teoría de la cospiración. ¿Sera casual que ese año es el unico en que Webber durante parte de la temporada sumaba mas puntos? . 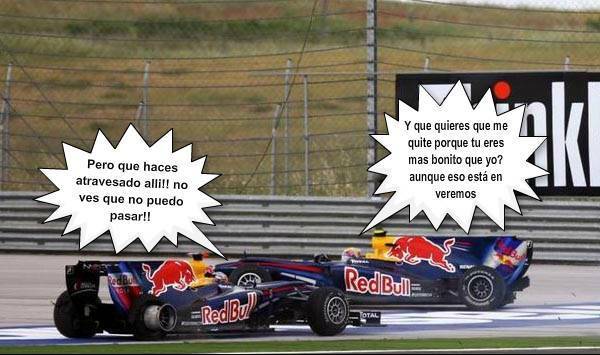 Pobre vettel. Esta gafado o van a por él.